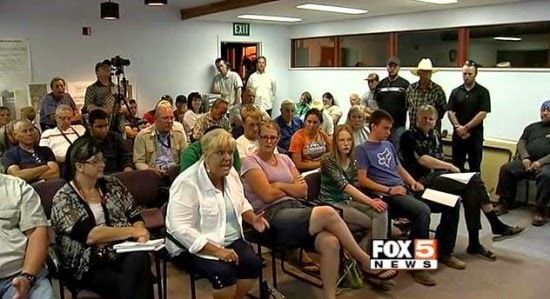 Bluegrass Pundit: How do Bunkerville residents feel about BLM, Cliven Bundy and Militias? How do Bunkerville residents feel about BLM, Cliven Bundy and Militias? It's not what the mainstream Media would like you to believe. An emotional crowd gathered for a town hall meeting on Thursday evening in Bunkerville. “The day the militia [came] was the day I felt safe again in Nevada,” one meeting attendee said. The meeting was standing-room only. City council members had harsh criticism for the media’s take on the standoff between Bundy and the BLM. “I heard things said down there. And then when it came out on the air it was a completely different animal,” Bunkerville Councilman Duane Magoon said. “Tell the whole truth. Don’t spin things to get your ratings,” another council member added. One council member criticized Gillespie, saying he’s been AWOL in Bunkerville. “I’m really disappointed in our sheriff for not being out here to protect the citizens who are out here,” he said. “It’s insane and a way overreach of their power. They should be held accountable,” a meeting attendee said.